30 seconds of brilliance from Kevin Mirallas was enough to earn Everton a crucial three points, as the Blues continued their push towards European football. In truth this wasn’t a fantastic advert for the Premier League, however the win, Everton’s third consecutive in the league, has maintained the pressure on the teams directly above the Toffees in the table. Disappointingly, Tottenham and Arsenal picked up relatively easy wins, but Everton know that their destiny remains in their own hands, with trips to White Hart Lane and The Emirates to come during a nerve tingling April. With the influential duo of Pienaar and Fellaini missing through suspension, Moyes sprung a tactical surprise by switching to a 3-5-2 formation for the first time in his tenure at Everton. Despite the victory, my personal opinion, is that this tactical switch failed to have a positive impact on Everton’s play. The midfield struggled to adapt for the first 20 minutes, with the Blues incredibly sloppy in possession. Coleman and Baines, who both had licence to push forward, were at times left isolated on the flanks, especially when in attacking positions. In contrast, Everton did secure consecutive clean sheets for the first time this season, and despite coming under pressure from Stoke in the second half, Everton’s defence stood strong. The key moment in the game arrived just after the half hour mark. 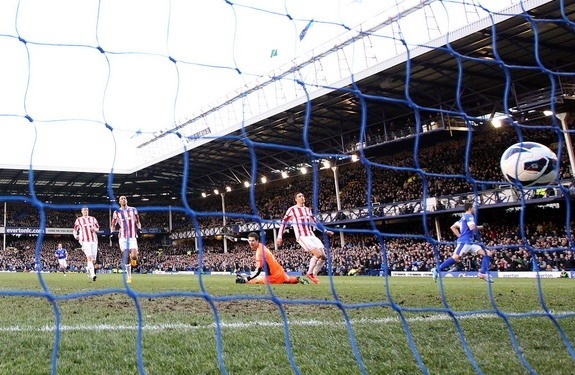 With Stoke preparing a set piece, Mirallas was left in the hole between the penalty area and the half way line. A strong clearance fell perfectly for the Belgium who immediately set off on a run from deep inside his half. At first he appeared to stumble on the ball, but when N’Zonzi in the Stoke midfield did the same, the ball was left in the path of Mirallas. He broke away with lightning pace, turning the Stoke defence inside and out before firing his shot through Begovic and into the Park End net. A quite superb goal from a player very quickly making a reputation for himself. Overall another strong weekend for the Blues. David Moyes and his Everton team will realise that much work remains between now and the summer, but on this evidence, the Toffees will push their London rivals all the way. Spurs up next, with a positive result a necessity.